Microsoft announced in February of 2018 that the upcoming Windows 10 Pro for Workstations version would get a unique power scheme called Ultimate Performance. Windows 10 Pro for Workstations is a special version of Windows 10 designed specifically for high-end tasks and applications that require lots of RAM and processors. To distinguish Windows 10 Pro for Workstations from the consumer-orientated Windows 10 Pro, Microsoft revealed that Windows 10 Pro for Workstations would support features that Windows 10 Pro would not support. The company mentioned expanded hardware support (more CPUs and RAM), support for creating volumes with the Resilient File System (ReFS), or persistent memory support. Microsoft failed to mention that Windows 10 Pro supported some of the features as well and that it limited ReFS support in Windows 10 Pro. The Ultimate Performance power scheme is a new power plan that is only available in Windows 10 Pro for Workstations. Designed to reduce micro-latencies to boost performance, the power plan changes settings that Microsoft collected over time that "allow the OS to quickly tune the behavior based on user preference, policy, underlying hardware or workload". You need to download the power plan to the local system as it can't be enabled directly on Windows 10 version 1709 (Fall Creators Update) and earlier versions of Windows 10. You can download the plan from this web host. Extract the archive to the local system. Open a command prompt interface. Note: you may need to adjust the path accordingly as your username is probably not martin and if you placed the plan in a different directory. You should get the "Imported Power Scheme Successfully" message right away. Open the Power Options on the device. You can do so by tapping on the Windows-key, typing Power Options, and selecting the Control Panel result from the list of results. You find the new plan after selecting "show additional plans". Select it to activate it on the device. Tap on the Windows-key to open the Start Menu. Hold down the Shift-key and Ctrl-key, and select Cmd.exe from the list of results. Select yes when the UAC prompt is displayed. Run the command powercfg -duplicatescheme e9a42b02-d5df-448d-aa00-03f14749eb61. Now You: Which power plan is enabled on your device? Instructions for integrating the Ultimate Performance power plan that Microsoft created specifically for Windows 10 Pro for Workstations on Windows 10 Home or Pro devices. Anyone checked if there’s a difference between that and high performance? The advanced power settings of both are same. Personally i’m using balanced with no sleep, never turn off hdds and cpu min 5%. First two are reducing the hard drive’s lifespan (most failures happen at spin up) and min 5% because i don’t see why should my 5820k work at full oc’ed 4.2ghz when i don’t do anything too demanding. Spin up failure? I think you should consider replacing your drive. I never get problem by using no sleep and no turning of HDDs. When your car breaks does it happen when you’re going down the highway or when you try to start it in the morning? Most of the time, it will be when you try to start it. It’s the same story with anything that has a moving part including hard drives. I agree with keeping them spinning if you have a computer that is always on. I hadn’t thought of it until I read this post, but I think it’s a good idea. Unfortunately, I have a raid array that I would like to keep spinning but I also have an eSata Probox with 4 drives that I use for backups, and I wouldn’t want them spinning all the time. As far as I know, it’s all or nothing. If anyone knows a way to change the power plan per drive or per volume, please do let me know. Great post. There’s a simpler way to locate the ultimateplan.pow file for CMD. Using “Copy as path”. 1. In File Explorer, locate the UltimatePlan.pow file. 2. Hold down the Shift key and right click on the file. Then select “Copy as path” from the context menu. 3. Open a CMD window. 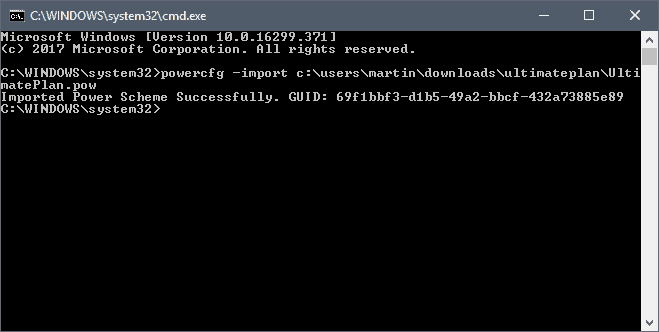 Type “powercfg /import ” and then paste (Ctrl+P) the file and location into the CMD window. 4. Press Enter and you are done. 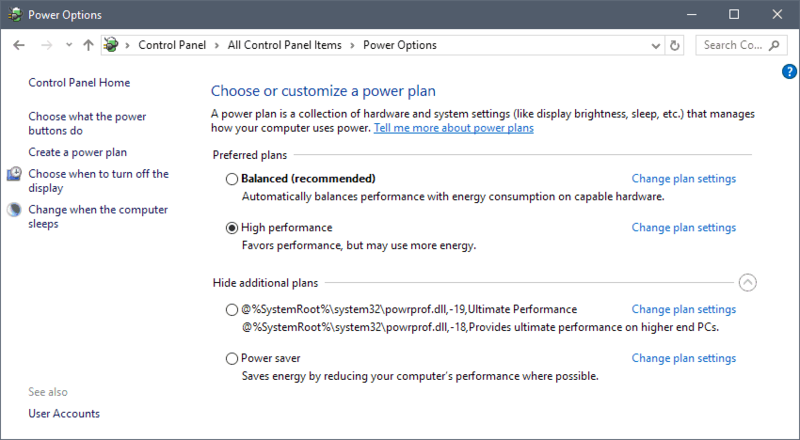 I only use Windows 10 on my work-provided laptops, but on those I use a custom power plan. When plugged in, the settings are entirely about maximizing performance. When on battery, I use the “standard” performance plan. The laptops are never unplugged for more than an hour or so at at time.